Wellfleet Bay on Cape Cod is as unspoiled a natural paradise as you will find anywhere. Surrounded by the reeds and estuaries of a wildlife sanctuary, the coastline curves to form a barrier beach ending in the long, spindly strand of Jeremy Point. Those intrepid enough to hike out along the beach are rewarded with a panoramic explosion of sea, sky and sand. One day, in the fall of 2007, however, ecologist Julie Ellis was confronted with a very different scene. “We pulled up in a boat, and what hit us before we even set foot on the beach was the smell,” she says with a wince. As she and her fellow biologists walked up the beach toward Jeremy Point, they threaded their way through hundreds of dead and dying common eider ducks, some curled up with heads under their wings; others lethargically sat on the sand, panting for breath. Ellis had heard of the mysterious annual die-offs of the ducks since arriving at Cummings School in 2006 to head SEANET, the Seabird Ecological Assessment Network, a science program that works with citizen volunteers to monitor the health of water birds. But the sheer numbers of ducks dying that year made the potential threat to wildlife and public health too great to ignore. Suspecting a mass infection of some kind, Ellis began reaching out to scientists and government officials to investigate. Handsome, large-bodied birds with thick down, common eiders are widespread throughout Europe and North America, where they nest on offshore islands from Canada to Massachusetts, and winter in the thousands on Cape Cod and Nantucket Sound. While they are not endangered themselves, they can serve as an indicator species for larger environmental problems, and their wide-ranging travels drew concern that they carried a virus that could make other bird populations sick. Since 2007, at least 3,400 birds have died, according to U.S. Department of Agriculture estimates. 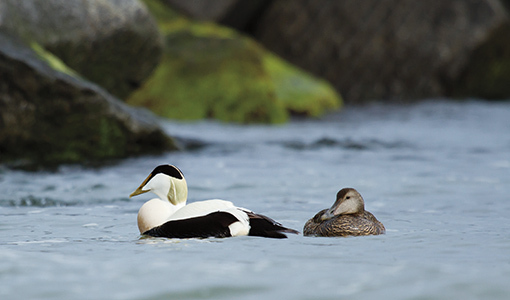 “We think of species like common eiders as an important barometer of marine health,” says Chris Dwyer, a wildlife biologist with the Northeast regional office of the U.S. Fish and Wildlife Service, who started working with Ellis in 2009 to investigate the duck deaths, coordinating dozens of scientists and government officials to take part in the effort. Whenever citizens reported die-offs, biologists with USDA Wildlife Services leaped into action, collecting fresh carcasses and shipping them to laboratories around the country. Time was of the essence, because viruses degrade quickly in tissues after death. Initial lab reports were inconclusive. But then, in 2010, Ph.D. student Andrew Allison received some common eider carcasses at the University of Georgia. He removed the livers, macerated them to break open the cells and spun them down in a centrifuge to separate the tissue from any viruses, which, because of their small size, would remain in a liquid solution. He then added that solution to cultured cells derived from other ducks or monkey kidneys (which are particularly good for growing viruses). Over time, the cells began to die and detach themselves from the rest of the tissue, a sure sign that a virus was present. After giving the virus time to grow and multiply, Allison sequenced part of its genome and found that it was an orthomyxovirus, part of the same family as influenza viruses. “That was the eureka moment,” says Allison, now a postdoctoral fellow at Cornell University. Since the virus hadn’t been previously detected in any other species, he dubbed the novel pathogen Wellfleet Bay virus. 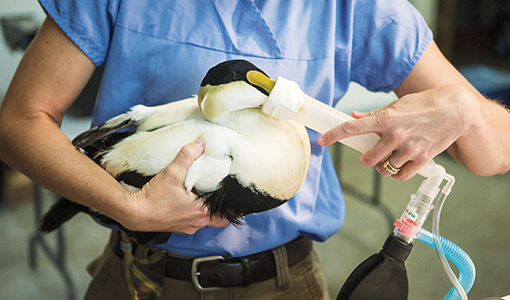 While identifying the virus was an important breakthrough, it was just the first step in getting a handle on how it might spread in nature and how it affects eider populations, says Ellis. “What’s next is to look at the potential impact of the virus on common eider duck management decisions,” she says. More worrisome, though, is that orthomyxoviruses also can mutate or swap genes with related viruses in a process known as reassortment. That can alter how viruses are spread or affect the severity of the diseases they cause. While Wellfleet Bay virus appears to be almost certainly limited to bird species, it was reassortment that produced the H5N1 strain of avian influenza, which has caused “bird flu” outbreaks since 2003. Studying how the virus is spread can help shed light on how similar viruses might mutate and propagate. “One of the biggest challenges facing biomedicine is understanding the complex environmental, viral and host factors that contribute to the emergence of these outbreaks,” Ellis says. Getting to the bottom of all these questions starts with understanding more about how and where a virus is transmitted. Since the Wellfleet Bay virus was identified, the U.S. Fish and Wildlife Service has helped facilitate the investigation, bringing in 23 organizations and agencies to conduct lab research, take blood samples in the wild and track bird-migration patterns via satellite. By studying antibodies present in blood samples, biologists have determined that the largest exposures of eiders to Wellfleet Bay virus have occurred among those nesting on Boston Harbor islands, which they think may be an epicenter for transmission. However, genetic information has shown that the birds found dead on Cape Cod are as likely to be from Maine as from Boston Harbor, leading the researchers to believe that along with the virus, other factors—such as nutritional stress from migration or simultaneous infections by gut parasites or bacteria—are exacerbating the outbreaks. Allison has noted parallels between the Wellfleet Bay virus and another closely related virus in South Australia, called Cygnet River virus, which has led to similar duck die-offs. Based on the genetic makeup of Wellfleet Bay virus, researchers have determined that the pathogen belongs to a group of orthomyxoviruses called quaranjaviruses, which are commonly spread by ticks or other insects. So far, however, samples taken from the ducks’ nests have failed to reveal any critters carrying the virus. Administered by Cummings School, the cooperative is a consortium of veterinary laboratories that helps provide lab work, education and research support to wildlife biologists in the region. Experts at Cummings School and at labs at Cornell, the New Jersey Department of Agriculture and the universities of Connecticut, Maine, New Hampshire and Pennsylvania have collaborated with biologists to investigate other animal epidemics, including moose die-offs caused by parasitic worms, and monitor potential human health threats, including a new strain of avian flu, H5N8, found in the Pacific Northwest and Canada.